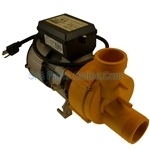 Spa Parts Online has huge stock of spa pumps and pump parts. Remember we have hands on service experience with every product we sell, so we are available with tech support, problem diagnoses, installation help, and should it be needed warranty issues. This Pump is a 1 Speed used as the secondary jet pump. For the Primary 2 speed Pump see 6500-343. With the removable motor base, the pump can be rotated to any position that you need. Pump does not come with an electrical cord or motor base. You can reuse the electrical cord from the pump being replaced. 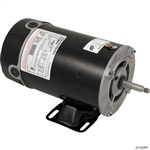 The 6500-341 has 2" threaded intake and discharge, (The outer diameter is 3 1/16"). In most cases you can use the current unions you have but we do recommend replacing the union o-rings at the same time as the pump. 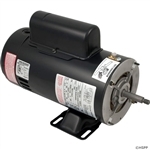 If you have questions reading the information from your pump motor please see our motor label page, or watch our quick video. As always we are here to help if you have a question email or call us. 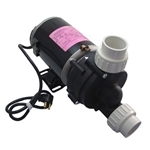 Spa Parts Online sells new Sundance and Jacuzzi Theramax pumps. We can not stress enough the unreliability of reconditioned or rebuilt spa pumps. 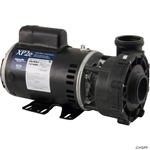 Since 1997, Sundance Spas has made various pump changes to Theramax, Theraflo, and Aquaflo pumps. The most important change on the new pumps is the transition to a bracket assembly (Part number 6000-532 sold separately) for mounting the pump/motor. The old style pump/motor had a fixed mounting foot for a specific pump rotation. With the new bracket mount, the entire pump can be rotated to the required orientation.